Increase in sales of inverter is one of the good indicators of the industry performance - from residential installations up to utility-scale PV projects. According to a report by GTM Research, by 2016, PV inverter prices will by pushed down from a global blended average of $0.22 per watt in 2012 to just $0.14 per watt in 2016. This is a compound annual reduction of 10%. Solar inverter, or PV inverter, converts the variable direct current (DC) output of a photovoltaic (PV) solar panel into a utility frequency alternating current (AC) that can be fed into the electrical grid. GTM Research says that global PV demand is expanding to markets in China, India, Southeast Asia, South America and regions of Africa. 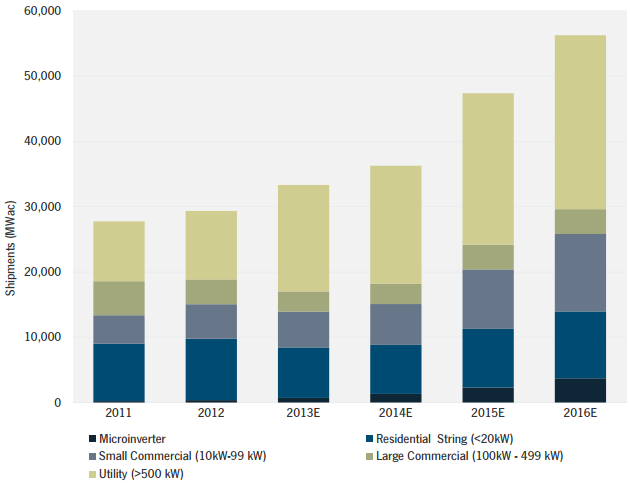 This expansion of global demand will lead to increased competition and slower growth for EU-based inverter incumbents who do not diversify from their domestic base. At the same time, this expansion is providing new supply opportunities to US- and Asia-based inverter manufacturers and to global energy conglomerates. "While SMA continues to dominate the rankings, near-term growth will be challenging as it competes with new low-cost or well-capitalized suppliers. Even so, unseating SMA and achieving success globally will not be easy despite a fragmented landscape." TheGreenMechanics: Thumbs up! Competition can only lead to one thing - efficiency. Thanks for reading. Hope you found something useful.